Gravity Dam; Its Construction, Advantages and Disadvantages. Gravity dams are massive structure dam which is constructed of concrete or stone masonry. These dams are hold by the gravity to the ground. A gravity dam depends on its own weight for stability and is usually straight in plan although sometimes slightly curved. A gravity dam can hold a large amount of water. As they rely on their own weight, it is necessary to construct them on a solid foundation of bedrocks. A gravity dam may be constructed either of masonry or of concrete. Masonry gravity dams are nowadays constructed of only small heights. All major and important gravity dams are now constructed of concrete only. A gravity dam may be either straight or curved in plan. A gravity dam is mostly straight in plan and is known as ‘straight gravity dam’. However, it may also be slightly curved in plan. A curved gravity dam resists the external forces by its weight and not by arch action. The most ancient gravity dam on record was built in Egypt more than 400 years B.C. of un-cemented masonry. Archaeological experts believe that this dam was kept in perfect condition for more than 45 centuries. Most of the gravity dams are solid, so that no bending stress is introduced at any point and hence, they are sometimes known as ‘solid gravity dams’. A gravity dam, however, can be hollow and is known as ‘hollow gravity dam’. Gravity dams are particularly suited across gorges with very steep side slopes where earth dams might slip. Where good foundations are available, gravity dams can be built up to any height. The highest dams in the world are of gravity type. 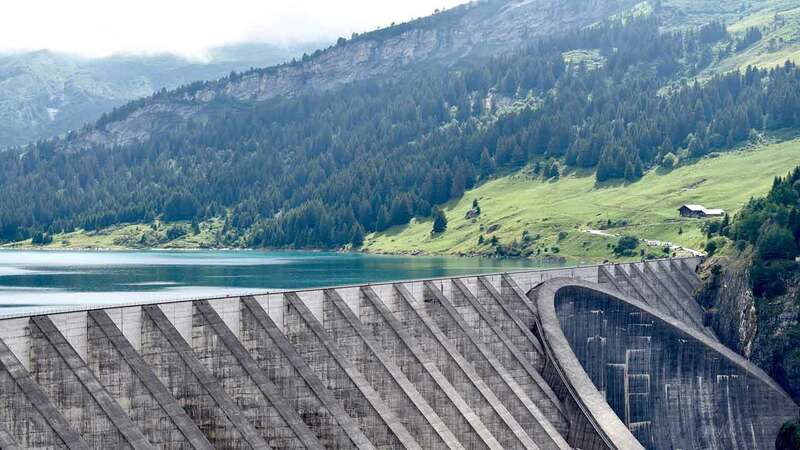 Read More: Arch Dam: Its Types, Advantages, Disadvantages. Before construction work in a river channel can be started, the stream flow must be diverted. In two-Stages construction, the flow is diverted to one side of the channel by a cofferdam while working proceeds on the other side. After work on the lower portion of one side of the dam is complete, flow is diverted through outlets in this portion or may even be permitted to over top the completed portion while work proceeds in the other half of the channel. If geologic and topographic conditions are favorable, a tunnel or diversion channel may be used to convey the entire flow around the dam site. A tunnel is particularly advantageous if it will serve some useful purpose after completion of the dam. Four 50 feet circular concrete-lined tunnels were used for diversion at Hoover Dam and later converted to outlet works. A diversion channel or tunnel should be capable of carrying a flow selected by frequency analysis as a reasonable risk in view of the hazards on each particular job. It is advantageous to schedule construction of the lower portion of a dam during normal low-flow periods to minimize the diversion problem. The foundation must be excavated to solid rock before any concrete is poured. After excavation, cavities or faults in the underlying strata are sealed with concrete or grout. Frequently a grout curtain is placed near the heel of the dam to reduce seepage and uplift. A cement grout and water are sometimes mixed with a small amount of fine aggregates (sand) is forced under pressure into the holes drilled into the rocks. Grouting at pressures up to about 40 psi may be done before concrete is placed for the dam, but high-pressure grouting (200 psi) is done from permanent galleries in the dam after the dam is complete so that the weight of the dam can resist the grouting pressures. Concrete for the dam is usually placed in blocks depending on the dimensions of the dam, with a maximum width of about 50 ft on large dams. The maximum height of a single pour is usually about 5 ft. Sections are poured alternately so that each block is permitted to stand several days before another one is poured next to it or on top of it. After individual sections are poured, they are sprinkled with water and otherwise protected from the drying effect of the air. After the form work is removed, the lateral surfaces of each section are painted with a paint (asphaltic emulsion) to prevent adherence to adjoining sections and to form construction joints to reduce cracking of the concrete. Keyways are provided between sections to carry the shear forces from one section to the adjacent one and make the gravity dam act as a monolithic structure. Metal water stops are also placed in the vertical construction joints near the upstream face to prevent leakage. Inspection galleries to permit access to the interior of the dam are formed as the concrete is placed. These galleries may be necessary for grouting operation, for operation and maintenance of gates and valves, and as intercepting drains for water which seeps into the gravity dam. When concrete sets, a great deal of heat is liberated, and the temperature of the mass is raised. As the concrete cools, it shrinks, and cracks may develop. To avoid cracks, a special type of cement (low-heat cement) may be used. Very lean mixes are also used for the interior of the dam. Two sacks of cement per cubic yard of concrete are not uncommon. In addition, the materials which go into the concrete may be cooled before mixing concrete. For best results, the temperature of the concrete mix should be between 50° and 80°F. Occasionally, further cooling is accomplished by circulating cold water through pipes embedded in the concrete, although this is expensive and is generally used only on large gravity dams. Thanks for Reading don’t forget to share it. 1. Gravity dams are relatively more strong and stable than earth dams. They are particularly suited across gorges having very steep side slopes where earth dam, if constructed, might slip. 2. Gravity dams are well adapted for use as an overflow spillway crest. Earth dams cannot be used as overflow dams. Due to this, a gravity overflow dam is often used for the spillway feature of earth and rock-fill dams. 3. They can be constructed of any height, provided suitable foundations are available to bear the stresses. The height of an earth dam is usually limited by the stability of its slopes requiring a very wide base width. 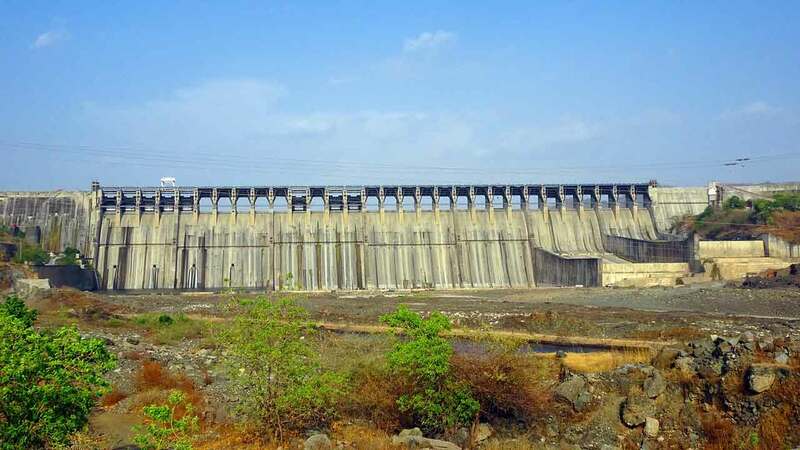 Highest dams in the world are made of gravity dams only. 4. Gravity dam is specially suited to such areas where there is likelihood of very heavy downpour. The slopes of earth dam might get washed away in such a situation. 5. They requires the least maintenance. 6. The failure of this dam, if any, is not sudden. It gives enough warning time before the area to downstream side is flooded due to the damage of the structure. On the contrary, an earth dam generally fails suddenly. 7. Deep-set sluices can be used in the gravity dams, to retard the sedimentation or silt deposit in the reservoir. The trap efficiency of a reservoir of an earth dam is more than that of a reservoir of gravity dam. 8. They are cheaper in the long run since it is more permanent than any other type. Thus the benefit-cost ratio of such a dam is always higher. Read Also: Canal Head Works – Its Function, Components, Site Selection. 1. Gravity dams can be constructed only on sound rock foundations. They are unsuitable on weak foundations or on permeable foundations on which earth dams can be constructed with suitable foundation treatment. 2. The initial cost of a gravity dam is always higher than an earth dam. Hence, where funds are limited and where suitable materials are available for the construction of an earth dam, the earth dam may be preferred. 3. If mechanized plants, such as manufacturing and transporting mass concrete, curing of concrete etc. are not available, a gravity dam may take more time to construct. 4. They require skilled labor or mechanized plants for its construction. 5. It is very difficult to allow subsequent rise in the height of a gravity dam, unless specific provisions have been made in the initial design. Read Also: Methods of Irrigation – A Complete Guide.